Judges (from left) Andrews Tolman, Mike Thibodeau and Virginia Manuel taste water samples during the Maine Rural Water Association's annual meeting in Bangor on Thursday. The judges tried 10 samples in two categories. Samples of water are poured for the judges during the Maine Rural Water Association's annual meeting in Bangor on Thursday. 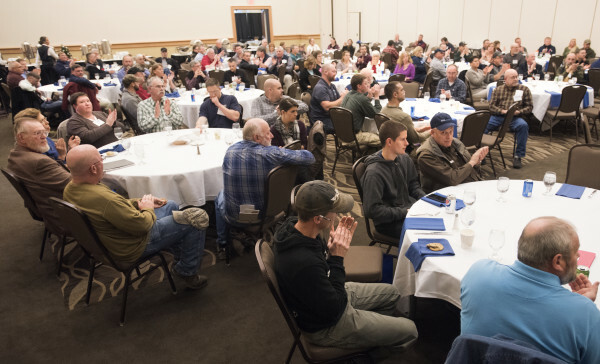 People attend the Maine Rural Water Association's annual meeting in Bangor on Thursday. BANGOR, Maine — It’s official: Limestone has the best-tasting water in Maine for 2015. 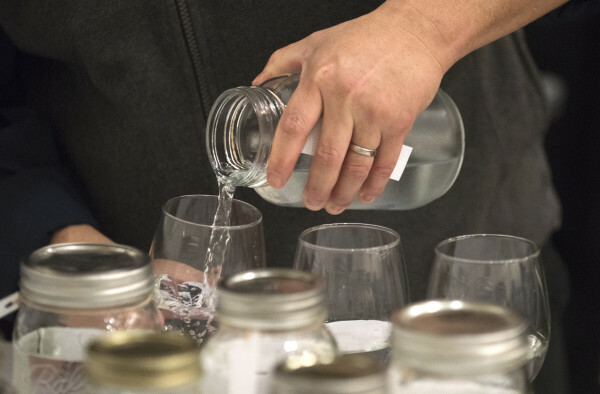 That’s according to the panel of judges who presided over the Maine Rural Water Association’s 29th annual Best Tasting Water contest held at the Cross Insurance Center in Bangor. 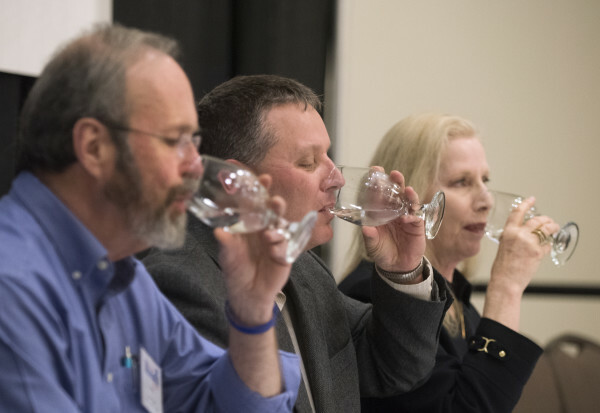 Thursday’s tap water taste-off was among the highlights of the association’s 35th annual conference. For this year’s competition, a total of 26 samples — 17 of them in the disinfected category and nine in the nondisinfected category — were submitted by drinking water suppliers from around the state. From there, the top 10 samples of water after pre-testing — the best five disinfected and the best five nondisinfected — made it into the taste-off. All of the samples were served chilled — and unlabeled — in small glass goblets. Not unlike a wine tasting, the samples were judged on clarity, taste, freshness and similar characteristics. In the nondisinfected category, Red House Farm Village Condo Association was judged to have the best water. In the disinfected category, the Limestone Water and Sewer District was named champion. After a final round of tasting, the judges awarded Limestone top honors and bragging rights for Maine’s Best Tasting Water for 2015. As the statewide winner, Limestone gets to submit a sample to the National Rural Water Association’s Rural Water Rally in February in Washington, D.C.
James Leighton, superintendent of the Limestone Water and Sewer District, said Thursday that the district has made it to the final five in its category before. “That was good enough for us — to come down from a small district in northern Maine and do that is nice,” he said. The district’s two groundwater wells serve fewer than 1,000 people, he said. This year brought Limestone’s first statewide win, he said. “We’re going to bring this back to The County and be proud of it,” he said of the award. USDA Rural Development State Director Virginia Manuel, who was one of this year’s judges, was among the first to offer her congratulations. “With so many quality water systems in Maine competing, selecting a winner was a challenge but Limestone takes home the title to its proud community,” she said. The other two judges were Maine Senate President Michael Thibodeau and Andrews Tolman, a hydrogeologist. Maine Rural Water Association Director Kirsten Hebert said Thursday that providing drinking water for the public is a tremendous responsibility. Last year, the Bangor Water District took home the best-tasting water trophy.